Posted by David Gillespie in branding, web 2.0. 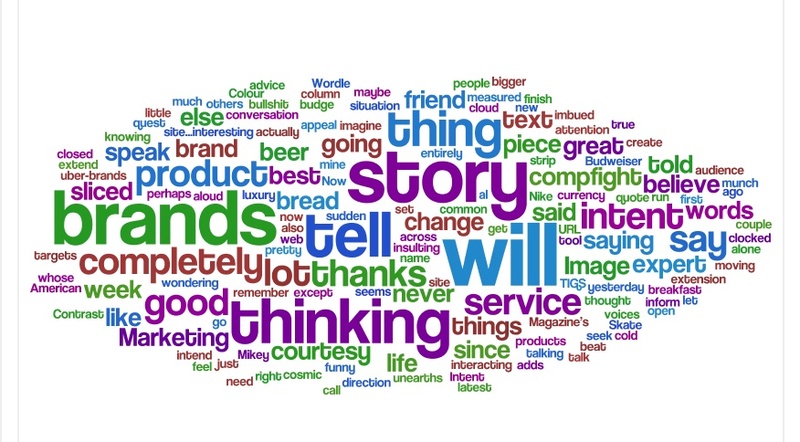 The most commonly found words, tags and categories on this site. Just came across a brilliant little tool called Wordle (thanks to Now In Colour). Punch in a URL or a piece of text and it will create a word cloud using the words appearing most often in the text. From the looks of things, we’re not where I originally thought this blog was going to go, but I feel like we’re moving in the right direction. i love wordle too. have even had tshirts made! brands, stories, thinking – not a bad place to be at all. “(…) business are present in a really social media, the Internet, hence businessess should also become naturally social.” Nice.